Karachi Port, located at geographical position 24.49 N, 66.59 E, On the shores of the Arabian Sea northwest of the Indus River Delta, is the first ever port of Pakistan. The port of Karachi is one of the largest & busiest ports of South Asia handling about 60% of Pakistan’s cargo and its ideal geographical position places the port in close proximity of major shipping rountes such as Strait of Hormuz. Ships calling Karachi Port and waiting for berth should anchor at a safe distance clear of fairway buoy which is located at position 24 – 44.65N & 066-57.20E (about 3.25 NM from Manora Light House bearing 204T. Karachi Port is divided into two major parts of East Wharf & West Wharf. East Wharf consists of three Oil Piers & DBs 01 to 17 including Pakistan Container Terminal (PICT berths 6,7,8&9) and DBs 18 to 29 including Karachi International Container Terminal (KICT berths 26, 27, 28 & 29) on the West Wharf. The permissible draft at the Oil Piers ranges between 11.20 & 12.50 depending on the type of cargo to be discharged or loaded where as at DB 01 to 17 it ranges between 10.00 & 13.00 meters. The East Wharf berths are generally used for the intended ships to discharge their cargo whereas the West Wharf berths are used for ships loading outward cargo. Pakistan International Container Terminal (PICT), a modern container terminal with total quay space of about 600 meters is located on East Wharf of Karachi Port. PICT is spread over an area of 210,000 square meters with a total handling capacity of 750,000 TEU per annum. The terminal is equipped with 06 quay size gantry cranes with support of adequate yard equipments and over 300 reefer points. 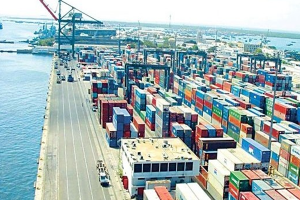 Karachi International Container Terminal (KICT), with 600 meters of quay space and total area of 26 hectares is located on the West Wharf of Karachi Port. The terminal is equipped with 09 gantry cranes, supported with sufficient yard equipments and over 500 reefer points can handle TEUs per annum. The deep water container terminal with 10 berths of 18M has been planned and the initial feasibility has already been completed. Once completed, 5th & 6th generation container ships would be able to call Karachi conveniently to discharge their cargo.